The two main shopping streets in Brussels are the Rue Neuve and Avenue Louise. Rue Neuve runs from Place de la Monnaie, about 300m north of the Grand Place, to Place Rogier, near Brussels-North Station. It is where you'll find big department stores like Galeria Inno or the City2 shopping centre. The area around Rue Neuve is a bit ill-frequented though. If gangs of (mostly Arabic) young males make you feel uncomfortable, you might prefer the Woluwe Shopping Centre below. 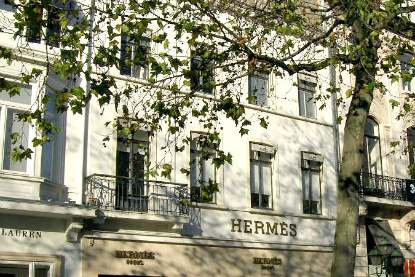 Avenue Louise is Brussels' Champs-Elysées, where most of the posh boutiques and the great names of international fashion can be found. 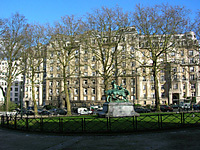 Avenue Louise is one of Brussels longest streets. It runs from Place Louise (Metro : Louise), between the Palais de Justice and Palais d'Egmont, to the Bois de la Cambre, 3km downhill. The upper section is where all the shops are. 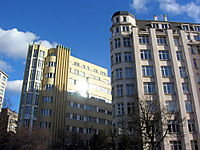 The rest of the street hosts numerous embassies and international companies (eg. airlines). Designer boutiques are in fact between "Louise" and "Trone" metro stations, on the inner side of the ring road (see map), on either side of the Hilton. Brussels' biggest and nicest shopping mall is the Woluwe Shopping Centre. It has over 150 shops, including a major branch of Inno Department Store. It is located at the junction of Avenue Paul Hymans and Boulevard de la Woluwe in Woluwe-Saint-Lambert, opposite Malou Castle. Using public transports, the easiest is to take the Metro line 1B until Roodebeek Station, which is connected to the shopping centre. Buses 29 (passing through Central Station), 42, 45 and 359 also stop nearby. Chocolate lovers will find the finest praline-makers on the Place du Grand Sablon, located between the Central Station and the gigantic Palais de Justice. This is where you will find Pierre Marcolini and Wittamer, as well as more prevalent brands like Neuhaus and Godiva. This area is also the place to go for antique shops. Going northward on Rue Royale till the Place du Congrès, you will find yet another celebrated chocolate-maker, Mary's - which only has that one shop. The rising star among chocolate makers is Jean-Philippe Darcis, who opened his first shop in Brussels (Petite rue au Beurre, 14) in 2007. If you are in for a splurge, one of the "secret" places that most locals don't even know of is the Neuhaus Chocolate Outlet. In this "chocolate factory", you will be able to purchase pralines by boxes of 1 kg at rock bottom price (e.g. 1 kg for 10 € instead of 35 €, and 3 kg for 20 €). It is located just outside the outer ring of Brussels, near Erasmus metro station (line 1B). The address is 2, Postweg in Vlezenbeek (Sint-Pieters-Leeuw). Godiva also has a similar outlet at 4, Avenue de Jette in Koekelberg. The nearest metro station is Simonis. Notwithstanding, discounts vary a lot from one day to another, and are usually not as big as at Neuhaus. Most souvenir shops are to be found in the historical centre around the Grand Place. This is the place to buy Manneken Pis corkscrews, Belgian beers playing cards or glasses, traditional lace or gobelin tapestries, souvenir postcards or even EU collectibles. The streets immediately around Place Sainte-Catherine and Bourse/Beurs Station are some of the most cosmopolitan of the capital. This is the place to look for ethnic shops, supermarkets and restaurants, especially Asian ones. The area has the highest concentration of Chinese restaurants in Brussels. 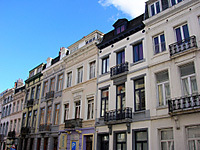 A street like Van Praet could be called "Brussels' China Town", although it is not officially known as such. Most of the businesses catering for the Japanese community of Brussels can be found around the junction of the Chaussée de Vleurgat and Avenue Louise. Among them, Nagomi (formerly Tagawa) has a Japanese supermarket, a Japanese bookshop and a Japanese restaurant. Eurex and JAL Pack ( in the Louise Centre building ) are two travel agencies with Japanese staff specialising in flights and tours to/from Japan. For electronics and home appliances, try the chain Vandenborre. For computers, the chain Exell has branches in the main shopping areas listed above. For photographic and video equipment or mobile phones, Photo Hall and Action Shop (shop names may vary) have franchises all over Brussels. If you need a combination of all the above, go to the huge Media Markt, on the top floor of the Inno Department Store in Rue Neuve. There are 6 Carrefour hypermarkets around the greater Brussels. They are located in Auderghem, Kraainem, Evere, Berchem, Strombeek-Bever, Drogenbos and St.Pieters Leeuw. The two first ones can be accessed by metro (Demey Station on line 1A for Auderghem, and Kraainem Station on line 1B for Kraainem). There are also two Cora hypermarkets in the capital, one in Anderlecht (along the Ring road, near Erasmus Hospital), and the other in Woluwe-Saint-Lambert (along the E40 motorway). IKEA has 3 branches in the EU capital. They are in Zaventem (north-east), Anderlecht (west) and Ternat (north-west, towards Ghent). 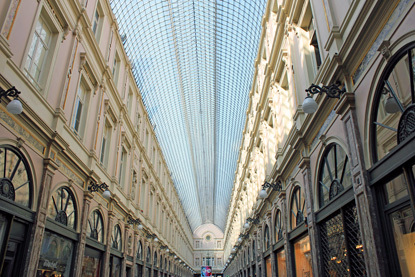 The largest shopping centres in outside central Brussels are the Westland Shopping Center in Anderlecht, the Woluwe Shopping Center in Woluwe-St-Lambert, and the Basilix Shopping Center in Berchem-Sainte-Agathe. Please consult the French version of this page for the list of libraries in Brussels. The best English-language bookshop in Brussels is Waterstone's, located at 71-75, Boulevard Adolphe Max, a stone's throw from City2 Shopping Centre and Inno Department Store in the northern part of Rue Neuve. There is another big English bookshop, Sterling Books, next to the southern end of Rue Neuve, at 39, Rue Fossé aux Loups ("Wolves Ditch Street"). The EU quarter's place to to go for English-language publications is The English Shop, located at 186, Rue Stevin. There are some very nice French-speaking bookshops with a limited English language section. Filigranes (Avenue des Arts 39-40, between Arts-Loi and Trône metro stations) has over 100,000 titles on 1,700 m2. Apart from being very modern and pleasant, this bookshop has the advantage of being open 365 days a year, and of having a café inside. The newly opened Cook & Book, in front of the Woluwe Shopping Center, goes even further, with an actual restaurant inside the bookshop. The shop is divided in 9 sections, each with its own theme. It is also open all year round, until 9pm, 10pm or midnight depending on the day - something exceptional enough in Belgium to be mentioned. The kitchen is open the whole day as well. There are quite a few comics and manga bookshop in Brussels. There is a list of 36 shops on Brusselscomics.com. Brüsel and the above-mentioned Filigranes are among the biggest ones in the city centre. Another one worth mentioning is Nine City, a huge complex (3,000 m2) which, in addition to the bookshop itself, has a comic museum, a lunch café, an exhibition hall and an event hall. It is located on Brussels' middle ring road (32 Boulevard Reyers in Schaerbeek) between Meiser and Diamand tramway stops (lines 23, 24 or 25, or bus 63 from Central Station). Parvis de St-Gilles - 1060 St Gilles : every Sunday & Tuesday from 5 am to 12 noon. Rue Deknoop - 1140 Evere : every Wednesday from 8 am to 12 noon. Avenue Vermeylen - 1140 Evere : every Thursday from 8 am to 12 noon. Brocante place Pinoy (Place Pinoy - 1160 Auderghem) : every 1st Sunday of the month. Most of the big tree nursery and gardening shops are outside Brussels, or around Laeken and Uccle. The largest of the kind in Brussels (15,000 m² including 1,600 m² of greenhouses) is the Pépinières de Boitsfort in Watermael-Boitsfort, at the corner of Avenue des Archiducs and Square des Archiducs. Just outside Brussels, along the Ring Road between Woluwe and Uccle, you will find the Pépinière du Long Fond, which is larger and generally cheaper than the Pépinières de Boitsfort. The address is Chaussée de Bruxelles 117 in 1310 La Hulpe.